The Nissan Cube finally debuted at the LA Auto Show last month, but before that Nissan debuted their Nissan Cube pre-reveal website. 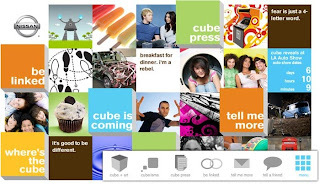 The site was tailored to the attention deficit disordered consumer with plenty of clickable cubes that brought you to no content about the car, just a bunch of stuff about cube-isms (witty sayings written by Nissan’s marketing group) and the ability to share the site with your friends. My question is share what? The pre-reveal site had no content about the car. In fact, there is only one shot of the vehicle in a small 150-by-150 pixel shot of the car in a 3/4-rear angle. 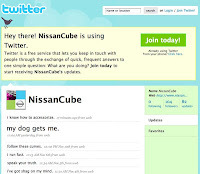 The site also featured a Twitter link allowing you to subscribe to Nissan Cube Twitters. There were updates nearly everyday that just sent you more “cube-isms”. There were 118 followers and 88 updates. Some real examples: “my dog gets me”, “I’ve got shag on my mind”, “I roll with the carpool” and my personal favorite “why all the fuss over money?” Huh? The Twitter ended when the car was revealed in LA and now asks people to visit their… you guessed it – Facebook page. What I wonder is did the Twitter increase engagement? Possibly, but most likely not. The witty statements did fit with the cutesiness of the car and it’s youthful target certainly fits a Twitter user. The big issue I have with the execution is why end it on Twitter when the car is revealed? Few people would ever visit the pre-reveal site since it is not aligned with all of the press releases and auto show coverage. Seems Nissan could’ve had a more significant Twitter audience if they kept it going with their new reveal site and Facebook page.